With the season over and another six months until the puck drops for next year, Steve Tambellini has a lot of questions he needs to answer. The first question on his list is who will be steering the ship for next year? Steve likes to keep his cards close to his chest and has given no evidence whatsoever what will happen to Tom Renney. Steve has a few months to decide about who will be coaching the Oilers, it would be unorthodox to go to the draft table without a head coach! My question is what is the deadline for Renney? If he`s not signed by the end of the month than there`s simply too many questions and management will look elsewhere for a new coach. The second question is of course Ryan Smyth, my understanding was Ryan was supposed to have been signed shortly after the trade deadline. That was a few months ago and it's pretty clear the two parties can't come to an agreement. Similar to the Hemsky negotiations, Tambellini is sticking to his guns and won't offer Ryan anything more than an one year deal. We all know that Smyth wants to remain an Oiler but how much of a home-town discount is he willing to surrender. Tambellini is playing a dangerous game with Ryan Smyth and Oilers fans; let's hope the two parties come to an agreement before the draft. The final nagging question that has to be on Steve's mind is the forever injury problems that has plagued the Oilers these last few seasons. Something needs to be done, injuries is an unfortunate part of hockey but could injury prevention be the problem. Training staff can only do so much, could it be the players aren't taking the necessary precautions. Maybe the training staff need to babysit the players and make sure they're prepared for each game. Obviously there are more questions to ponder but Tambellini definitely needs to address these issues for next year. For me, I only have one question for Steve Tambellini, what the F is going on with Linus Omark? Why was he called up if Renney had no intention on playing him. Why isn't there better communication between management and coaches. With the call-up, Omark can no longer play in the AHL playoffs and the end result has only diminished his trade value. In typical Tambellini fashion, every time I start believing in him, he goes ahead and dreams up a bone-headed scheme. Steve Tambellini has a lot of questions and with typical Oiler fashion, Oilers fans find themselves asking too many questions as well. Oiler management do like to keep their fans guessing, I suppose it keeps the team in the limelight during the Summer. Hopefully next year we will all have fewer questions! What are you predictions for the draft? Do you have Vegas odds on what pick the Oilers is getting? 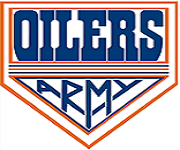 I honestly don't have a clue who the oilers will pick at the draft but first lets find out where the Oilers pick. If history dictates, the Oilers will pick a forward and I don't think that will change. Wilson has the ball and he predicts the Oilers picking Nail Yakupov. I'll tell ya that ball isn't just a pretty face.